1. Can I just drive to the Trailhead myself and hike Flattop for free? Yes. You can and you should. If you own, rented, or have a friend with a car, you do not need our service. Save money by driving to the trailhead yourself and hike whenever you want for as long as you want. 2. OTHER THAN YOUR SHUTTLE, HOW ELSE CAN i GET TO AND FROM THE TRAILHED? Rent a car. During the off-season (October through May) rental cars are only about $25 per day. Collaborate with other hikers who contact us and meet up at the bike rental. We frequently introduce hikers to one another so that they can split the cost of a taxi. From downtown it costs $45 for a cab to the mountain or $90 round-trip. The phone number for the taxi company is 907-222-2222. Uber will be less. It is usually $35 from downtown to the trailhead with Uber but it can sometimes cost more to Uber from the trailhead back into the city. There is cell service at the trailhead and during the hike. Take a cab or Uber to the trailhead with a (rented?) bike in the trunk. If another person wants to do this, we'll introduce you to them so you can split the fare. We will help you load the 1-3 rental bikes in the cab and brief you on the different return routes back downtown. Rent a bike and ride it 16 miles on a bike-friendly route to the trailhead, hike, then bike back. The first half of the bike ride is flat. Then there is a one-mile-long steep hill climb. After that first hill it's slightly uphill for the next two miles. However after that, the last three miles are very steep. (See picture of road grade on Hike/Bike Combo page.) To bypass the last section of steep road, at the intersection of Hillside and Upper Huffman you could hold up a sign that says "FLATTOP" and make a happy face out of the O. You will likely get a ride within minutes from a pick-up truck or a car with a bike rack the rest of the way to the trailhead. (Every person that turns onto the road is going to Flattop and they're all healthy, active, positive, outgoing, helpful people.) Once at the trailhead you're set because you can ride after the hike unlock your bike and ride it downhill and flat back into the city. Rent an ebike from us for $50 and ride it to the trailhead. The battery has enough charge to make it up the hill (and then back downtown after the hike). Rent a bike and put it on the front of the # 25 People Mover bus (fare $2) from downtown to the corner of Tudor and Elmore. Click here for the route map and here for its Schedule. From there, bike south on Elmore Road then east on Abbott Road UP the remaining seven miles to the trailhead. After arriving at the trailhead, lock up your bike, hike, then when done hiking, ride it mostly downhill to downtown which should take between about 45 minutes to an hour. Take the #25 People Mover bus with your bike on the front of it to Tudor and Elmore then call a cab and pay it $25 to take you and your bike to the trailhead. Take the # 25 bus without a bike to Tudor and Elmore and pay a cab $25 to take you to the trailhead. When you're done hiking call a cab. Pay the $25 fare back to Lake Otis and Abbott where you can catch the inbound number 25 bus back downtown. 3. Do I need to give a deposit or credit card number to sign up? There is no deposit if you are by yourself or part of a group of three or less people. So that we can retain this flexible policy, if your plans change it is imperative that you EMAIL, TEXT or CALL to cancel. If you do not get a prompt acknowledgment, please follow-up using a different form of communication. Also, it is a good idea to reaffirm your reservation on the morning of the hike via text or by checking-in early at Downtown Bicycle Rental. For groups of four or more there is a $21 non-refundable deposit for the fourth person and each additional person after the fourth. For example: $42 non-refundable deposit for five people, $63 for six people and so on. Seats for four or more people can be reserved in advance without an advance deposit unless it is less than ten days before the scheduled date. If within ten days of the scheduled hike we haven't phoned you for the deposit (for your security your cc number will be punched directly into our machine), then please call us. 4. How OFTEN do seven OR LESS PEOPLE (minimum required) WANT TO GO? 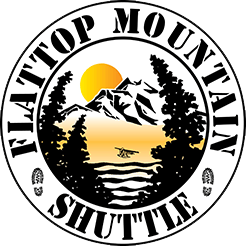 In June, July and August, unless it is raining, the shuttle not only goes up almost every day with seven or more people, it often sells out. Before Memorial Day and after Labor Day the shuttle might only get five or six people however we will still run it those that are here agree to make up the difference in revenue to equal $161. (7 x $23 = $161.) Therefore, if six people sign up it costs $26 per person. Five people - $32. If there are just four people it is cheaper for the group to share the cost of a cab or Uber. We will introduce hikers to one another and make sure your cab driver knows how to get to the trailhead. 5. What footwear is best for this hike? After all the snow has melted (late May) a hiking sneaker with good traction is best. In mid-May there is still some snow and mud on the trail so a hiking boot is preferred. During summer most people find hiking boots are too heavy and slow but some still wear them because they want ankle support. Bring light layers and a breaker that you can peel off as you heat up during the hike. It's better to over-pack than under-pack because you can assess the weather at the trailhead and leave behind in the van whatever you decide you don't actually need on the hike. Be prepared for cold, wind, and rain but also be prepared for hot and sunny in which case all you'll need is a t-shirt and shorts. If you're hiking in May and want to get to the top, some sort of glove is advised because you might need to claw into melting snow on the headwall just below the summit. 7. Can YOU pick me up or drop me off anywhere other than downtown? Because no one likes a milk run, after leaving downtown, there are only two places where we will stop to pick up additional hikers. The first is at the water fountain on the south side of the library in mid-town. It is located on 36th between A and Denali. The second is at the university in front of the Alaska Airlines Sports Arena. Advance arrangements and a non-refundable full payment is required to be picked up in midtown or the University. This is necessary because when someone requests to be picked up in midtown and fails to show up at the rendezvous point, the seat that could have been sold to someone on our wait list downtown will go empty. Almost everyone visiting Anchorage goes downtown at some point. Most people want to shower and re-group at their hotel after the hike but if you get picked up and dropped off in midtown, you might not ever see/experience downtown. If you're staying in midtown, want to see downtown, and also preserve the flexibility we offer hikers who check in downtown, take your hotel shuttle or the PeopleMover bus ($2) downtown in the morning, catch the shuttle to the mountain at 12:30, then get dropped off in midtown near your hotel after the hike at about 4:20. When we drop off in midtown it is either at 36th Avenue and Seward Highway, or 36th Avenue and A Street. Also, on the way back from the mountain, the driver asks if anyone wants to get off at the Alaska Zoo. From June 1 - August 31, the Zoo is open until 9 p.m. and has a free shuttle to/from downtown. 8. What happens if the shuttle sells out? We start a wait list and if someone who has signed-up doesn't show-up we trigger it at 12:30. If everyone who signed up shows up, we introduce people on the wait list to one another and explain the other ways to get to and from the mountain. There is strength in numbers. If there are four people on the wait list, they can simply split the cost of a cab which is the same price they would have paid the shuttle. They exchange sell phone numbers and agree to meet back at the trailhead after their hike at a time of their choosing. If there are less than four people, there are other ways and they are explained below at FAQ 9. 9. can i store luggage at your store or in the van while i hike? Yes. There is no charge to store luggage at our store. Items left in the locked van while you hike will be safe.